John Hayley, owner, holds degrees in Exercise Science and Business Management from Concordia University in River Forest, IL. He is a Level 2 Spartan SGX Coach and a Certified Strength and Conditioning Specialist (CSCS) through the National Strength and Conditioning Association (NSCA). John's work has included Head Strength and Conditioning Coach at Concordia University, Fenwick High School and Guerin College Prep and working in the strength and conditioning department at Northwestern University. Other work includes Exercise Physiologist and Coordinator of the GO Gottlieb Performance Training Program at Gottlieb Hospital Health and Fitness Center in Melrose Park, IL. At the core of “UNBREAKABLE” is commitment; a commitment to a lifestyle that continuously make sound decisions and good judgement toward improving the quality of one’s physical health. 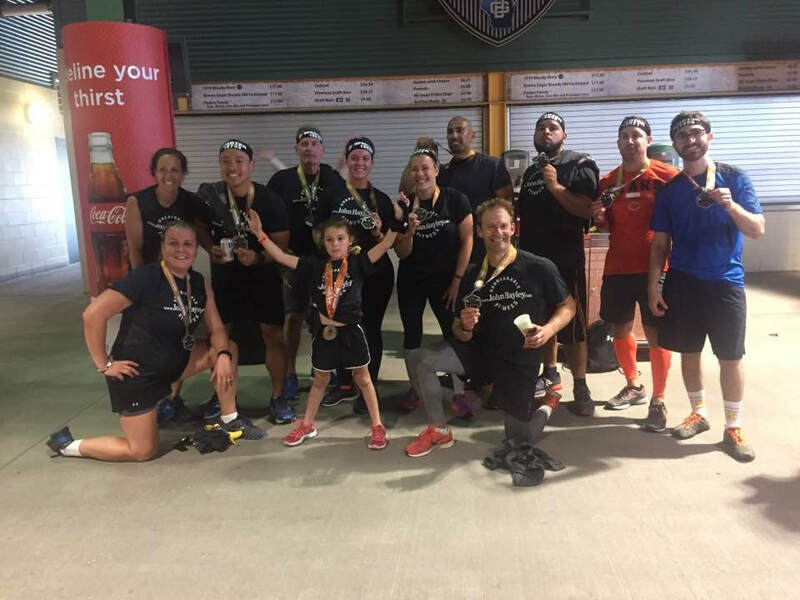 Whether the goal is to lose weight, build lean muscle, incredible strength, run an ultra-marathon, obstacle course race, 5k, or just to feel better, our programs can suit you. We want to inspire you and increase your accountability toward continual achievement of your personal health and fitness goals. Highly adaptable to all fitness levels, our 12 week sessions focus on developing complete fitness. Strength training, cardio conditioning, flexibility and especially nutrition habits are critical to any program and we integrate those components in our process. There are two basic tracks of unbreakable fitness: Spartan (SGX) or Total Fitness (formerly known as Boot Camp). Both programs build complete and integrated fitness through 3 phases of each 12 week program. These programs run concurrently and are open to all members. If you happen to miss your Spartan workout, but still want to come in, you are free to join the Total Fitness group (and vice versa). Both programs are progressive in design, moving from simple workouts to more challenging and advanced routines. In addition to the strength and conditioning classes, we have added classes that are available to most members according to the membership type. The major difference in the two tracks are that the Spartan classes have a root in obstacle course training, so there will be crawling, climbing ropes, jumping over walls, and more running and jumping than the Total Fitness track. Each 12 week program is designed to methodically and progressively take you out of your comfort zone and into the best shape of your life. Pick a program, dive right in, give it everything you’ve got; be consistent and see incredible results. Anything goes. Get yourself race ready as we combine strength training and endurance while often heading outside to tackle trails, hills and natural obstacles. Complement your weekly Unbreakable sessions with a workout designed to enhance mobility and range of motion. We will focus on posture and core stabilization exercises as well as work to increase range of motion in the hips, legs and shoulders. Run more efficiently and increase functional strength by adding this workout to your weekly training schedule. Feel better while enhancing your strength, stamina, flexibility and posture with Yoga. Start with learning the fundamentals of the poses and progress to more advanced postures over the course of the 12 weeks. Yoga for everyone and everybody. Using a variety of methods such as weight training, kettlebells, medicine balls, suspension and body weight to build incredible strength and lean muscle. Improve your endurance as we build stamina and conditioning using rowers, ropes, kettlebells, medicine balls and more. No running or jumping. ​Our training is based on deliberate, methodical movement. Our system teaches that learning the proper technique is the key to success. At Unbreakable Fitness, quality is more important than quantity. It is important for every client to realize that improved performance is already inside them. It is up to Unbreakable Fitness to bring it out. Once you master proper habits and techniques, the opportunity for success grows exponentially! Unbreakable Fitness offers a different experience than other group training programs. We care about the overall experience and the results of each person we coach. Although you are working in a group, you will get the individual attention necessary to teach you the proper techniques and methods to get the most out of your experience. Unbreakable Fitness will tailor programs needs to fit the group no matter how large, small, or the different levels of fitness within the group.